HoloTour is an immersive 360 degree virtual travel experience with holographic scenery and spacial sounds lets you feel like you’re really there. 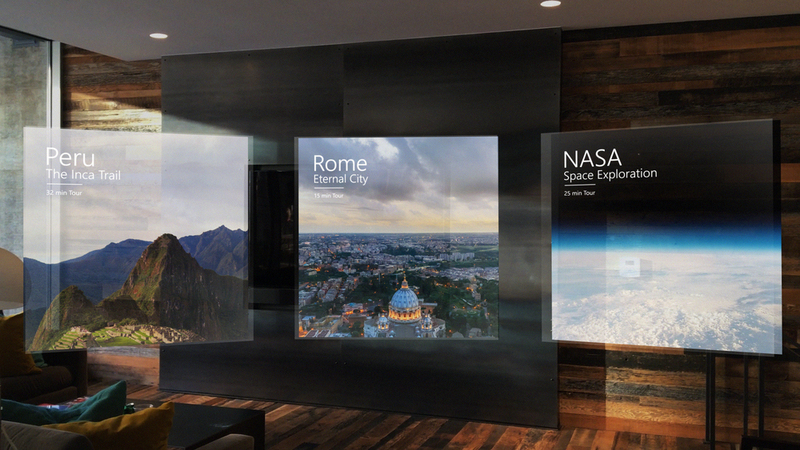 Its mixed reality design gives you the sense of depth with interactive 3D objects parallaxing in your space. In HoloTour, you’re able to select between Rome or Machu Picchu as your travel destinations. Melissa, your personal tour guide, shares historical and local facts with in-context visuals to help you really understand what you’re seeing. In 2014 I had the opportunity to work on a completely new platform at Microsoft. My role on the HoloLens team was a Motion/Visual Designer working on an immersive travel app called HoloTour (World Explorer). With HoloLen’s spacial tracking technology available to us we’re able to design interactions for Mixed-Reality (MR) experiences. My time working on this project started in the pre-production stage where my team and I explored ways to bring the experience of travel to your real space using holograms. Working with developers and other designers, I explored visuals and motion ideas by working in low-fi sketches to creating high-fidelity visual comps and motion studies. In After Effects and Cinema4D I would animate prototypes of UI, transitions and 2D/3D elements to visually communicate what I thought would enhance the app experience. New ideas would often spark from seeing the prototypes and the cycle would start again. This process would continue until we eventually converge and satisfy our design goals. CASE STUDY: An idea came to mind midway into the development HoloTour. I thought of an idea called the magic window however due to projects delivery gates it didn’t make it to the final product. The following is a case study for the "Magic Window" experience. Have you ever wanted to travel across the world just by clicking a button? The concept of the magic window gives the user a taste of that experience. You're able to preview your tour destination through a window as if it was a teleportation machine. We can only dream but perhaps one day in the future! This diamond like sheet functions as a visual feedback as the user selects a tour. This concept would be applied throughout the system as a way to teach the user its going to a new destination. Created and animated in Cinema4D. Design explorations for the startup sequence badge. World Explorer was the name of the project during pre-production. 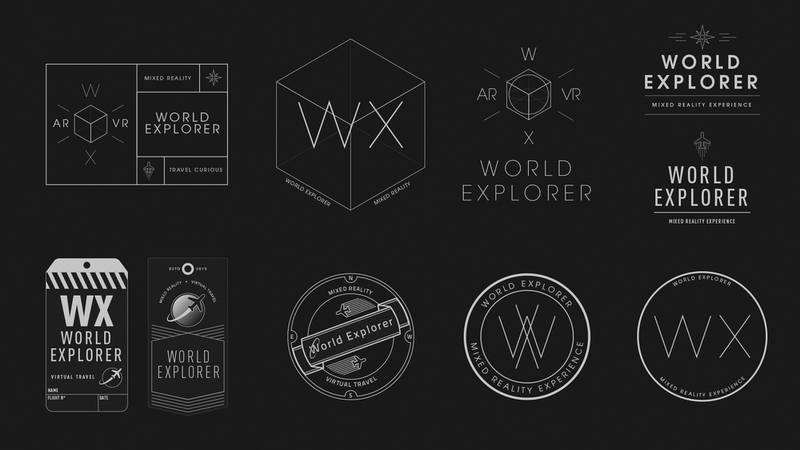 Project "World Explorer" was the name used during my time working on the project as a result many of my visuals below still reflect that name. This motion study showcases the initial sequence from title startup to tour selection mode with the "bloom" gesture. The motion and pacing was carefully choreographed to feel smooth and elegant as this is to help direct the user eye direction. To visually test out the magic window concept, this motion study was created. The pane of glass, text and the portal was designed to be placed in Z-depth layers to maximize the presence of depth. I designed the interaction of the "Begin" button to mimic the gesture of your arm and fingers. It would raise up and scale down creating an intuitive experience. In the tour, Melissa the audio tour guide will often direct you to look at a certain scenery or object. The Look Assistant is a tool used when the user is not able to find the object. I created this motion study to showcase how it would interact with your gaze. Quite a few objects in the tour are selectable. This motion study showcases the different states. activating object > back to idle. Globe and label animation prototype in your living space. Learn more about Microsoft HoloLens at http://www.microsoft.com/HoloLens.